Travertine is a heavy building stone that's been used in construction for centuries. Travertine is sold as floor, wall and counter tile, and as outdoor paving blocks. 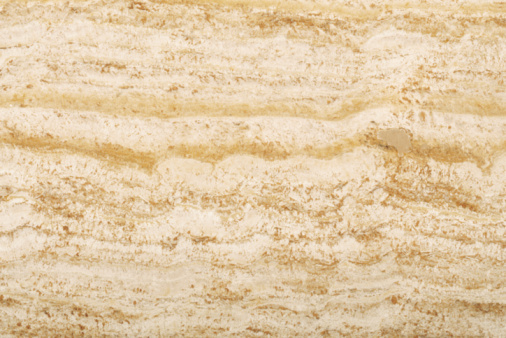 Travertine comes in striated earth colors of ivory, golden yellow, tan, beige, gray, dark red and brown. The color depends on what organic material was incorporated in the travertine during its formation. Travertine is a very heavy building stone. A typical 12-by-12-inch travertine tile that is 1/2 inch thick weighs 6.5 pounds. If you stack 24 of these tiles, you will have a cubic foot of travertine that weighs 156 pounds. Travertine tile is sold by the square foot, however, not the cubic foot. Travertine is cut from the Earth in big blocks, and the blocks are cut down into tiles for indoor use or pavers for outdoor use. The difference between a tile and a paver is the thickness; tile generally is ½ inch or 5/8 inch thick while pavers are 1 1/4 inches thick. Travertine is a sedimentary rock made of the same calcium carbonate as limestone. Travertine is slightly lighter than limestone because it is very porous. For instance, a 12-by-12-by-1/2-inch limestone tile will be 1.5 ounces heavier than the same size tile of travertine. Travertine was laid down in layers in shallow, mineral rich, naturally carbonated prehistoric hot springs. It got its porosity because of tiny bubbles from carbonation of the water where travertine was formed. Travertine's weight requires a firm and stable surface for installation. With a weight of 6.5 pounds per square foot for half-inch travertine tile, you will be adding 650 pounds of weight per 100 square feet of floor area. This requires a strong subfloor. If laying tile on a wooden subfloor, make sure your floor joists are stiff enough and strong enough to handle the extra weight by checking the floor's deflection. If your subfloor bends too much under load, your tiles may crack or pop up. For travertine tile, the maximum safe distance the floor can bow downward under load is figured by dividing the joist span in inches by 720. To check deflection, first calculate the allowable amount, then tie a string tightly across the span of the room and carefully measure the distance from the string to the floor. Put a load on the center of the floor equal to the expected weight of the tile plus other things normally found in the room. Measure the distance again from the string to the floor. If the floor's deflection is significantly more than the allowable amount, you may have to reinforce the floor. A simple test for your floor's ability to handle travertine's weight is to stand in the middle of the room and bounce up and down. If you feel obvious and considerable movement in the floor, you will have to reinforce your floor joists or consider a flooring material other than stone tile.